Crews are working across Boston to repair the many potholes on the roads after a cold, snowy stretch of weather. Potholes are everywhere this time of year, and for drivers, it becomes a challenge spotting them in time to steer clear of the crumbling asphalt. "Swerving to avoid them, it's definitely more narrow and then the potholes, they're constantly there," said Marsha Lyulyeva of Boston. "You damage your car,” said Steve Senneville of Boston. "I think I've blown out a tire or two." Public works crews are working long hours throughout Boston to try to fill as many potholes as they can before they do damage to cars. 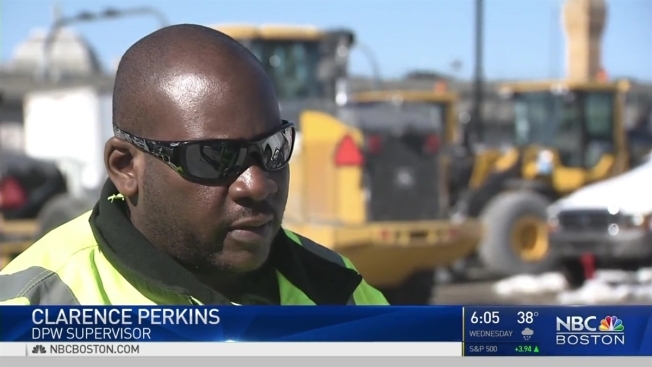 "With the winter, multiple plows out, the asphalt just gets ripped up, we're just going to out there for days just cleaning up and making sure everything's repaired," explained DPW Supervisor Clarence Perkins. NBC Boston followed along as a crew literally pounded the pavement in Brighton Friday, filling potholes reported by residents and other DPW crews. Perkins says while the warm weather after the freeze can create potholes, it also gives them an opportunity to repair more of them. "It helps us get caught up, take care of things before they get reopened or new things pop up on us," said Perkins. "So the good weather definitely helps us a lot." You can always call 311, click on the BOS311 app or tweet to @BOS311 to report a pothole. According to the city database, more than 21,000 potholes have been reported and more than 20,000 have been repaired.